Although the walkout is connected in a broad sense to workplace conditions, this isn’t the trade union strike of old. Google’s workers are mainly professionals: engineers, not laborers. They have well-paid, high-prestige jobs at a company known for recruiting top employees. Not all of the thousands of workers who walked out were personal victims of workplace sexual harassment. Nor did the signs and slogans associated with the walkout suggest that Google’s workers feel oppressed as a class. The protest, in sum, was not about the classic struggle of labor against capital or oppressive management. Rather, the Google walkout seems to have been about values, specifically the value of moral condemnation of workplace sexual harassment. The precipitating event wasn’t, say, reports detailing that there have been widespread instances of sexual harassment at the company. That seems to have been the motivating force behind the McDonald’s global walkout in September. The news that fueled the Google walkout was the New York Times report that the company had protected a series of very senior men associated with the company and accused of inappropriate sexual conduct connected to the workplace, offering them lucrative severance packages or keeping them on. The charges resonated with the #MeToo movement. The walkout therefore needs to be understood partly in that specific context. Google’s employees were signaling to management that they feel serious unhappiness with the corporate and general culture in which the instances of harassment occurred and were, essentially, covered up. Management seems to have interpreted the protest in this way. In an email, Pichai acknowledged that the problem of harassment “had persisted for far too long in our society.” And he promised his employees “the support you need” in connection with the walkout. In essence, Pichai was trying to get behind the walkout. That may have been clever corporate management, but it was also a recognition that the walkout did not need to be interpreted as criticism of Alphabet so much as an act of societal protest. This aspiration on the part of employees to take collective action in furtherance of global political goals is, I think, new in an important sense. Google’s employees may be setting a trend. And the accommodating response from management may contribute to it. But that’s not even necessary. 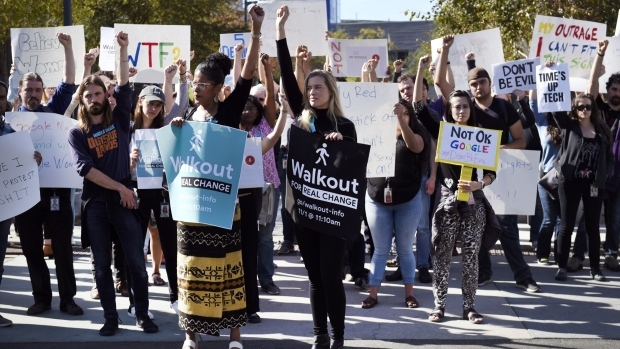 One can easily imagine employees at other tech companies staging future walkouts in solidarity with the Google employees – even without precipitating events at their own companies. Unlike the general strikes of the 1920s, the goal of such symbolic walkouts wouldn’t be to paralyze industry in order to win important structural victories for workers as workers. There would be relatively little economic cost, if any. As a consequence, management in the future might well support the walkouts, the way school administrators frequently do. Things would be much trickier for management if employees were taking positions that the companies don’t want to associate with themselves. But that would probably represent a different stage in the possible future development of this new practice.